Times, they are a changin’. Back in the day, we used to say : « look at that beard ! ». Now we can hear : « check that hipster out ! ». Alright, this is so 2015 but still, it works for many things. For instance, take that good ole truck where you could get a sandwich or a hot-dog for a buck or so that used to be a little old school, a bit homemade, like its food. Those driving restaurants (and not drive-in) quietly leave space to a much more elegant breed of trucks, the world famous « food trucks ». Though, we’ll agree on one thing : the most elaborated of those trucks in Europe look a lot like the ones you can see all across Northern America for quite a few years already. The tendency has crossed the ocean, like many other lifestyle fashions and it’s surely for our best. Their food is gorgeous, well-cooked, their concepts are sharp, they look good and they can go just about anywhere. 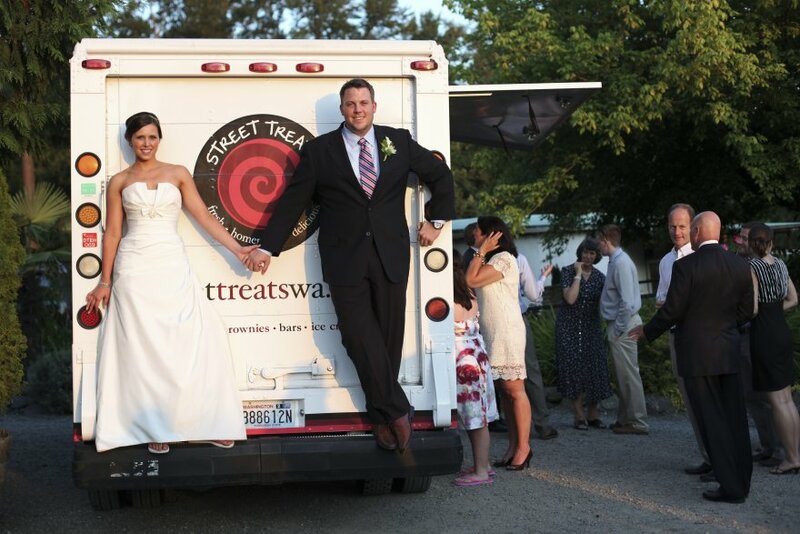 They are so versatile that more and more people tend to hire one of them for their wedding. But why ? Here a five very good reasons to choose that option even if you've done COCO&freddy's Wedding Day-tox Lovely Formula. 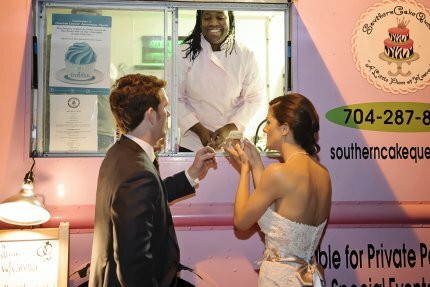 With a food truck, you reduce problems. No need to find a location with a big kitchen for the party. No waiters and no wait between dishes. Okay, you might have to get in a file to get your plate and maybe, you’ll eat something with your fingers. But ain’t it fun to do so at a weeding ? Just be careful with your sunday clothes. 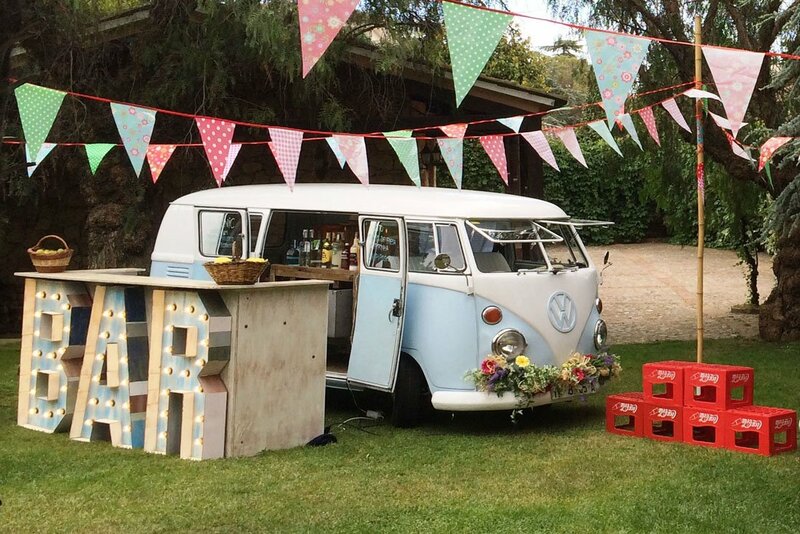 If you choose to host a garden party at your parents’ house, you might as well go for a food truck. Little hint, ask the owner for its service capacity. It must adapt to your guests lists otherwise, there will be traffic. But you also can get a second truck, for the sweets. Why not ? 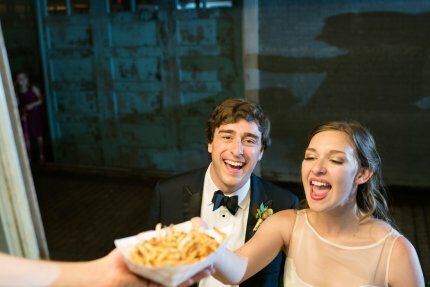 It’s your wedding after all. 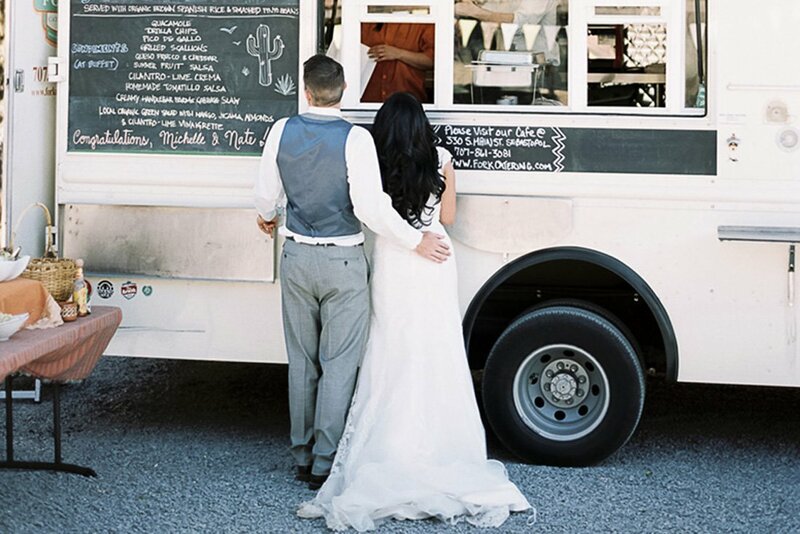 Before getting a food truck, you will define the menu and ask for a quotation. The prices will be very different from one food truck to another, depending largely on the kind of cooking you want but it still is pretty interesting. If you compare to a classic caterer, you can save from 40 to 50% of the bill. Paying five grands instead of ten is not a little thing when you invite 150 people. 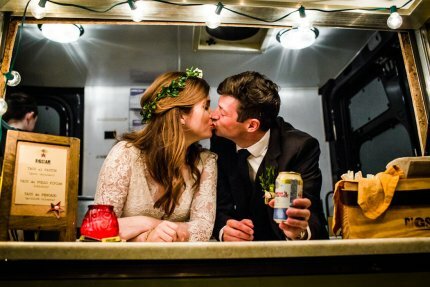 When you’ve been to one wedding, you’ve seen it all. Cocktail, a little dance, starters, a little dance. Toasts, main course, a little dance, and then, cake. 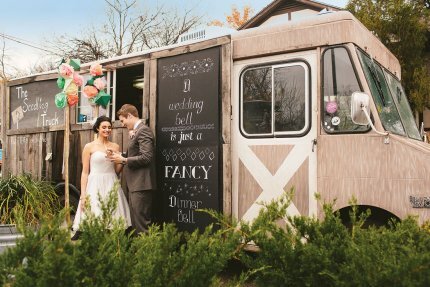 With their original recipies, vegan, burgers, bagels, italien or who knows what other kind of food, the food trucks represent a beautiful alternative to the classical wedding dinner parties. And remember, some of them are dedicated to desserts or ice cream, just like the one you were waiting for in your block as a kid. When you think of food trucks, you must keep in mind their specificities and looks. Most of the weddings have a theme. It’s either movie names for the tables, or TV shows, bohemian chic, classical, etc. 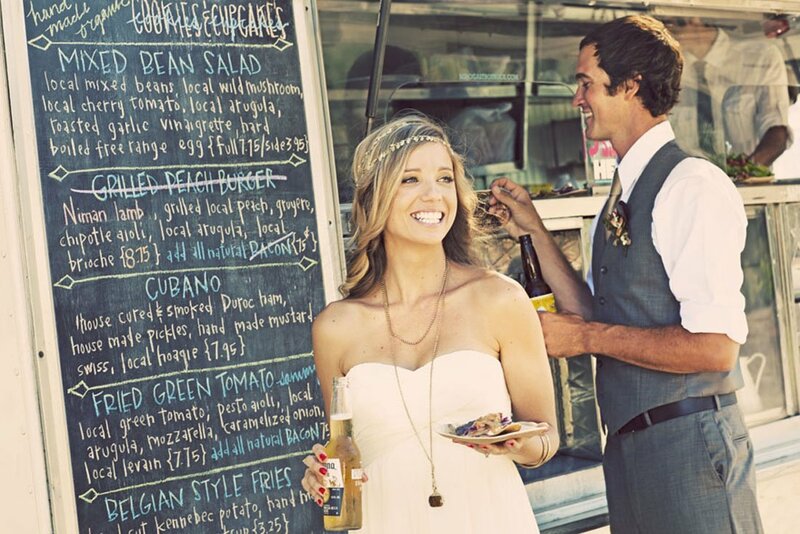 With a food truck, you can emphasize the theme by bringing a most original note to your wedding. The truck will be part of the party, and part of the scenery. If you choose a food truck, it’s surely because you love the food, or at least, the concept of food trucks. Their products are fresh, cooked right in front of your eyes. 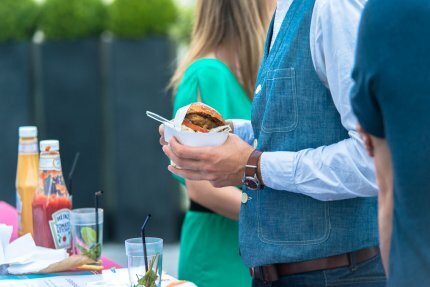 Caterers also propose that kind of service, especially for starters with finger food on demand, but it’s even better when the cook, the « chef » does it every day of the year. But don’t be too ambitious. 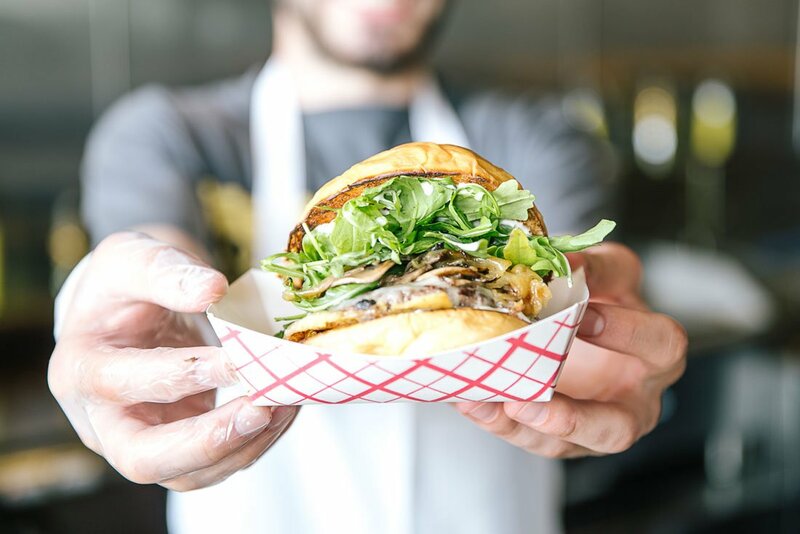 Try the food before reserving the truck, or pick a food truck you already know. You’ll be sure to be satisfied, and your so will your guest be. 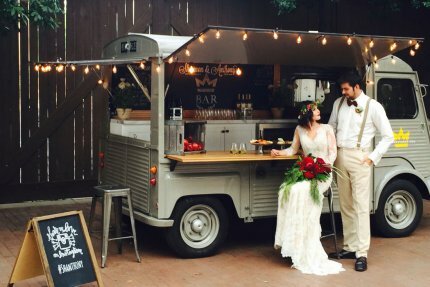 Pictures of newly weds, with their food truck.